Now that we have a handful of pets at level 3 or 4 in this 101 series, it’s time for our very first tamer battle! We’ll use the one in Elwynn Forest, but the one in Durotar is very similar. 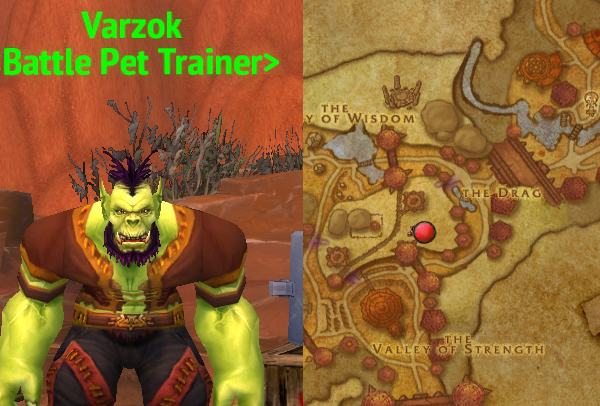 When you get your first pet to level 3, you’ll get a popup quest from either Varzok or Ms. Burnhep to come talk to them in Orgrimmar or Stormwind respectively. They’ll then send you along to your first tamer battle. 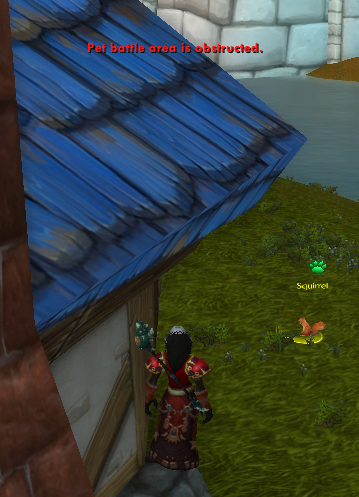 You can also find the tamers by looking at your big map for the green pawprints. You won’t be able to do the quests as dailies until you complete all of them on a continent the first time around. Tamer battles generally yield much better XP, both for your pets and your character, than wild battles do. Certain ones will give you a bag full of pet-related goodies as well. To be absolutely clear, this is largely a hypothetical to learn team building. I fully expect anyone who comes across their very first tamer battle to dominate it fairly handily. Or if not, level a bit more and then stomp all over it like you’re level 90 and visiting Wailing Caverns for a tea party. You do not need a tailored strategy for this fight, and really won’t until you’re fairly deep into Outlands or Northrend. The process for building your team will be the same. For this exercise, we’ll go with the very first Alliance tamer, but the first Horde tamer has a somewhat similar setup. Julia Stevens’ pets are both snakes. I can tell this immediately, because most tamers have their battle pets displayed helpfully alongside them while they’re out in the world, so you can get an idea before you even engage them what you should do. For tamer battles, you can enter the battle and forfeit to get a better handle on the abilities you’ll be facing, too. Usually if you flee a wild battle your pets take a 10% HP hit so that should be avoided, but you don’t take that same hit with tamer battles. In this case, we can see immediately that her snakes are both Beasts, both level 2. We can see that the first has poison, which is a fairly deadly damage over time spell, so we need to find a pet with an ability to counter a damage over time ability. This is where we make our first choice. We can either choose a defensive ability to block their attacks, or an ability with reflexive damage to turn their attacks into our attacks. The former is generally a more reliable strategy and more control over the fight, but will frequently make your battle last much longer. The latter will mow down the opposition in a couple turns, but also leaves us more vulnerable. At this point in the minigame, erring on the side of reliability is a good thing. You won’t be gathering up bandages for some time, so going to heal if you screw up can be a real hassle. After a while and a bit of bandage accumulation, you’ll likely turn more toward blitz strategies to save time. The tools for PVE and PVP team building are largely identical. 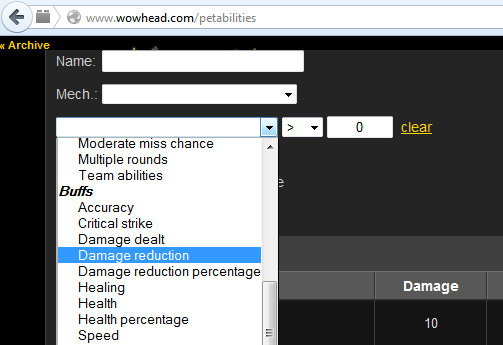 Wowhead is still the best resource for analyzing pet abilities. 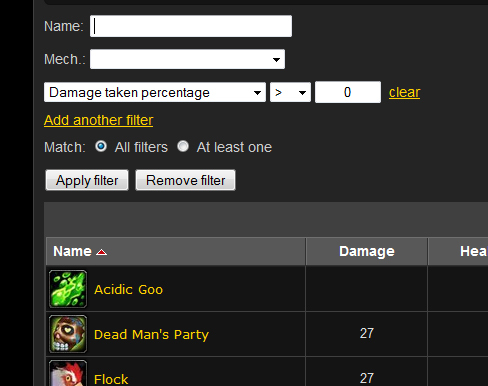 In this case, we’re going to look at Damage Reduction abilities. The abilities here will reduce each hit taken by a flat number. This is really excellent to counter damage over time abilities, but not so hot to counter big hit abilities. Of that list, the one that leaps out at me immediately is Spiked Skin, which is where we kind of run into a bit of an issue. Looking down the list, nearly every one of those pets are very rare, caught above level 20, or are only learned after a pet reaches level 15, making this kind of an exercise in futility for our level 2 scenario. By contrast Stoneskin is learned by the popular Feline Familiar at a very low level. One pet worth talking about here is the Anubisath Idol. The reason we’re not going to use him is because, although Sandstorm will shield us from poison, it also means that we’re not going to do a ton of damage on each hit ourselves. Also, the first attack the Idol learns hits weakly against Beasts, making this an all-around poor pick for this particular fight. 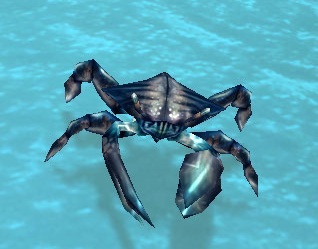 But here, we’ll look at Shell Shield, learned by many battle pets at a very low level, including a few pets that are very easy to get, like Speedy, which I just happen to have at level 2. 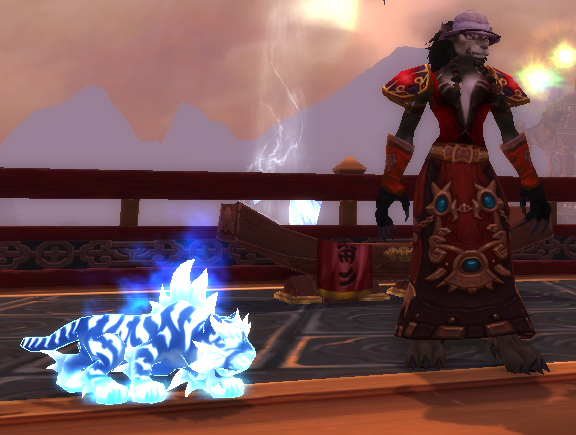 By now we’ll have at least 2 pet battle slots, so we’ll go through the same decision-making process for the second pet. Because the second snake doesn’t have that poison to watch out for, in the second slot, I’m going to go for offensive firepower. The best way to start with that is to look at your opponent’s family’s weaknesses & defenses. We can find this out either by going to our pet journal and looking at a Beast’s tooltip as seen above, or one of many handy infographics out there on the web. 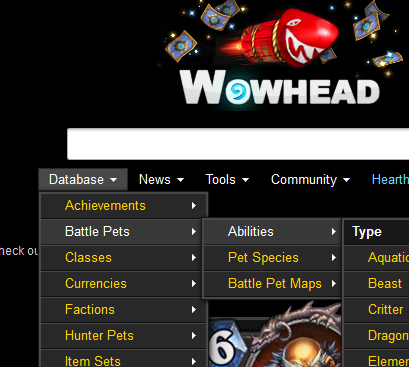 Another option is using another filter on WoWhead. I generally prefer the pet journal, because honestly those infographics usually read like stereo instructions to me, and my pet journal is like, right there. Over time, family interactions become second nature. Since both our opponents here are Beasts, we can see that Mechanical abilities hit them more strongly, but they defend against Humanoid attacks. I specify attacks, because some pets have cross-family abilities. The first snake is an example of this, as his poison does Elemental damage. 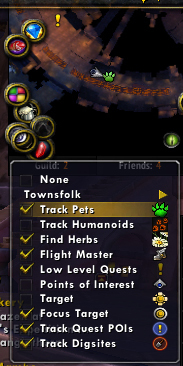 A UI addon like Pet Journal Enhanced will help find these cross-family pets. A mechanical is going to be a really good bet against these snakes. 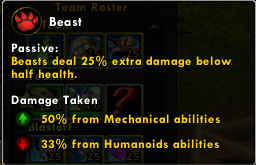 Looking through my own personal pets list, I see that I have a Clockwork Rocket Bot at level 3, which is an excellent fighter, and has its own mechanical damage over time to boot. I’ll put him in my second slot. Your best bet in any situation is to find a pet which will be both defensively and offensively strong against your opponent. If there were a Flying (defends strong against beast abilities) player-usable pet with a shield (defends against small hits like poison) and Mechanical offensive abilities (attacks strong against beasts) that would be the ideal pet to use here. The big difference between building a pet battle team for PVE and the previous post describing my process for building a team for PVP is that in PVP you need to focus on your own team and how it works together cohesively. For PVE most of building your team is based around countering the moves of your opponent in nearly any mishmash of 2-3 pets. This entry was posted in Pet Battles 101 and tagged 101, snaaaaakes, team building on November 4, 2013 by Liopleurodon. So, now you have a few slots and probably a few pets. This is where team building and synergy come in. Yes, I know I sound like I stepped straight out of Office Space in the previous sentence. The general idea of team building is that there are certain abilities and certain pet types which work together really well. If you can find pets that go well together, you’re frequently far better off than just picking 3 pets at random. A really good example of this is the Howl Bomb team previously discussed on the blog. Each specific member of the team brings something to buff each other, or an ability which benefits greatly from the buffs of the others, and then you annihilate your opponent. There are a few basic guidelines that almost always apply, all the way up & down the gamut of battling. 1. You almost always want to use pets from different families. 2. Buffs, Debuffs & Weather Effects = Good. The first is easiest to explain. In both PVE and PVP, most teams you face will have more than one family in its makeup. A family is a subset of pets with common defensive strengths and weaknesses. 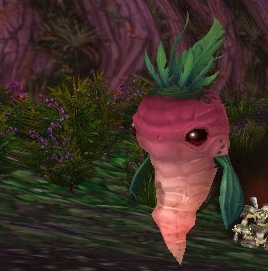 For example, all Undead pets defend weakly against Critter attacks. However, if you were to make up a team with a couple rabbits and a squirrel, all critters, and fought a snake and a couple scorpions in the wild, you would have a really hard time winning the fight, because the wild Beasts would eat your Critters alive. 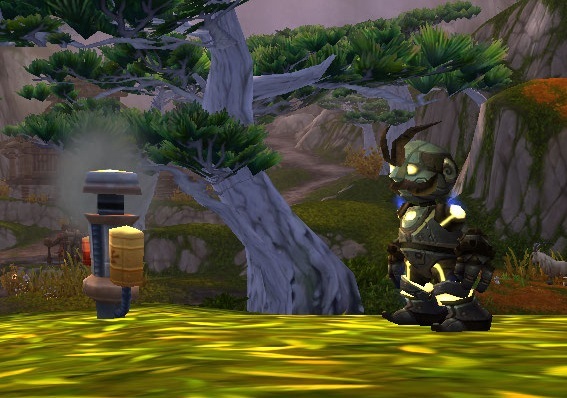 If you added a turtle you’d be better off, and a clockwork gnome in your 3rd slot would even things out nicely. Occasionally in PVP you may get lucky, and your team with a fel flame, water waveling and lil rags will come up against lil bling, a clockwork gnome and a tranquil mechanical yeti, but best believe the next opponent you face will be packing aquatics. The second point is easy to explain, but as you delve deeper it gets into additional impenetrable Office Space-style jargon. It starts out with the same idea as say, Curse of Elements. 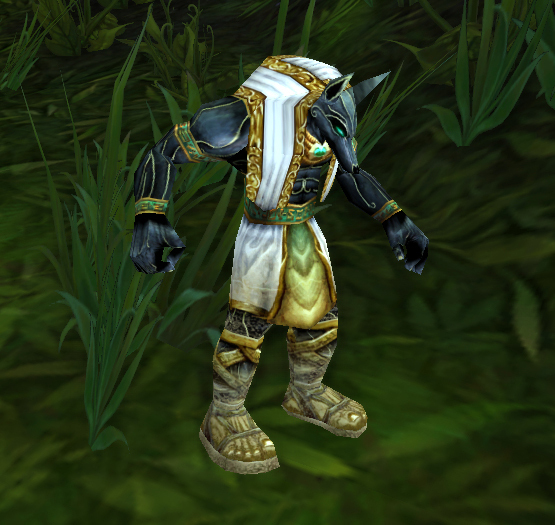 If you’re a mage and have a choice between bringing along a warlock friend with CoE or a dps warrior friend with the Sunder debuff, you’d probably bring the warlock, because sunder does nothing for you, and warlocks pretty much exist to give mages buffs. It’s similar with pet battles. If you have an Eternal Strider with Cleansing Rain, you’d be far better off bringing, say, a Curious Oracle Hatchling with Dreadful Breath than a Spider which has no bonus to give to the strider’s abilities and vice versa. That’s synergy. For lowbie wild fights, the family part is the most important. In the wild, there are usually lots of critters and beasts, and a smattering of aquatics and flyings. 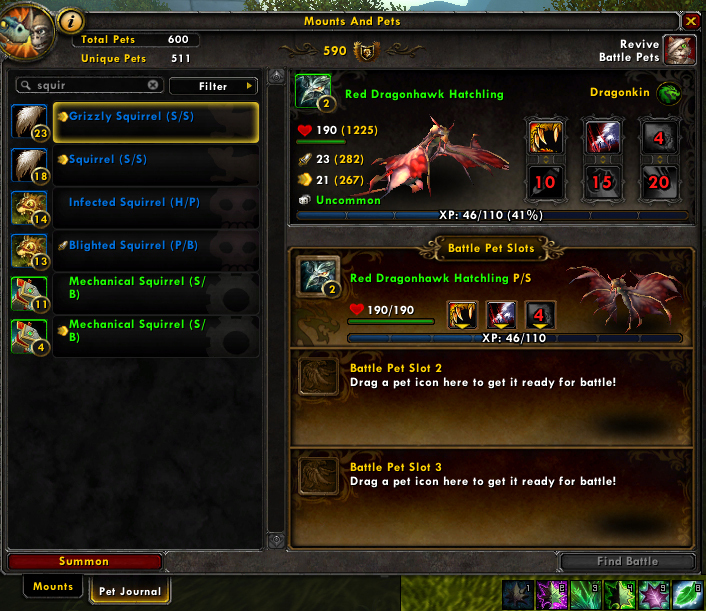 For the most part, if you join a wild pet battle, the seconds will be one of those 4 families. 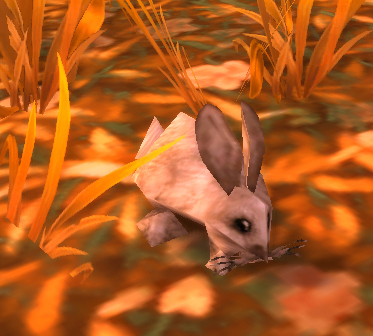 There are a few exceptions (winterspring & the plaguelands, for instance) but if your team features a pet which attacks strong against 3 of those 4, you’ll be in good shape. Namely, you’ll want something with beast, mechanical, flying or magic attacks. Some pets have attacks outside their family, so keep that in mind when you make your selections. If you’re going to level up organically (ie, not through a cascade method), you’re going to want at least 2 teams of pets, so you can swap things around and not visit the stable master every other battle. Keep in mind, you can supplement with caught pets if your current choices fall flat. When I first leveled up, my team included a Terrible Turnip I eventually had to ditch, because he did less against both beasts and critters, so my other 2 pets were pretty much dragging him along. And if you do make a poor choice, you can swap out on the fly without a ton of consequence. At this point, go level your chosen pets up to level 3 or so. Next post is team building for your very first tamer battle. This entry was posted in Pet Battles 101 and tagged 101 on October 1, 2013 by Liopleurodon. I’ve devoted a lot of time recently to hashing out strategies for the end-game of pet battling. While I was doing so, it occurred to me that I’ve barely touched the topic of starting out, leveling from scratch, and how to build your teams. So, I’m doing this brass-tacks set of strategies for pet battling. or Varzok in Orgrimmar. Varzok is on the upper level, near the flight master and the zeppelin towers. Your initial cost can vary a bit depending on your reputation. 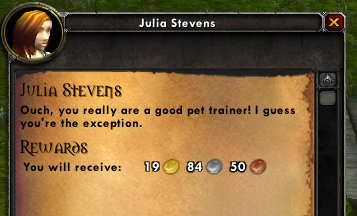 The trainers will also sell you a pet that varies depending on your race. 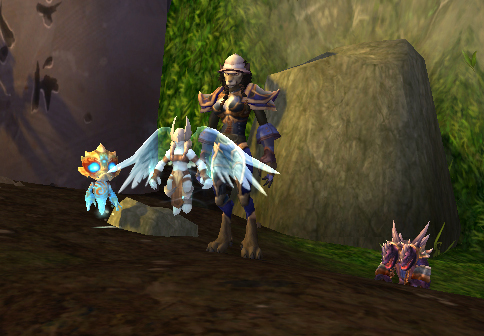 If you’re a Worgen, for instance, you’ll get a Gilnean Raven from Audrey (or any other pet trainer), while if you play a Blood Elf you get a Golden Dragonhawk Hatchling from Varzok. It’s fairly likely that you’ll have a pet or two from a holiday or something kicking around in your pet log, and you can use those as well. You’ll only get one pet from your trainer per character, so you can’t endlessly purchase and then flip those Ravens onto the AH for a tidy profit. All your pets are shared across your account, so if you’re on a fresh character or bank alt you’ll keep all the pets you already collected and leveled. This can make for some quick cash if you’re rerolling to a new server. To view your pets and set up your team, open your pet tab (either shift – p for the non-pet classes or click the pony in your minibar and then click on the Pets tab). 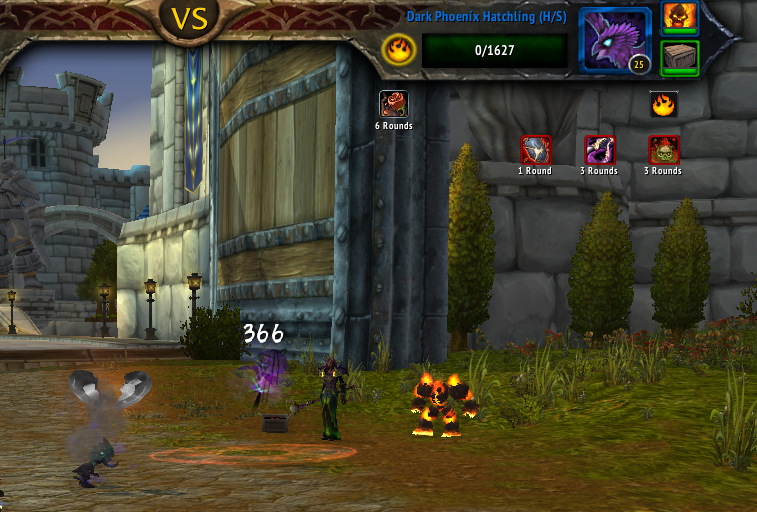 Yours will be slightly different, because I have a bazillion battling addons. You’ll see all your pets over to the left, with your team pane in the middle, and a selected pet up above. 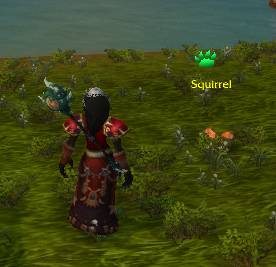 There’s also a search box above the pet list (I was looking for squirrels). 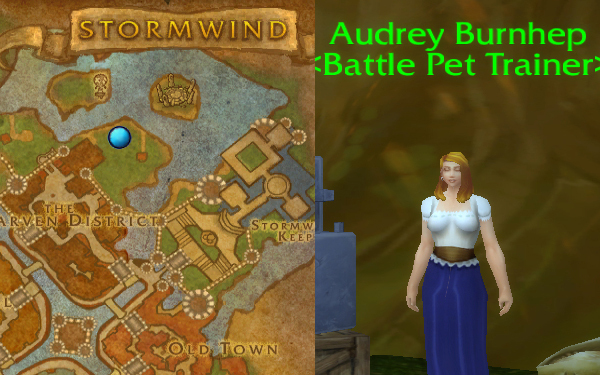 To put your pet on a team, drag the picture of the pet over on the left to the battle slot you want. To start, you’ll only have one, but will add more as you level up. You can swap to a different pet by dragging a different pet’s picture over the icon of the first. In PVE, the pet in your first slot will always join the battle first, and you’ll have to burn a turn to move that first pet out. In PVP, you get to choose who enters the battle first after you start. 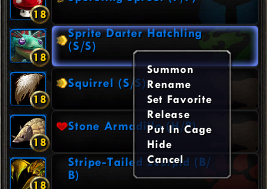 You can sell many pets by right clicking their name on the list to the left and hitting ‘Put in Cage’. You’ll get a cage item in your bags and can then AH or trade at your leisure. When you do so, you can’t use that pet anymore. You can re-learn it if you’d like, though. It will retain its breed and level. If you choose to buy a pet off the AH, you can only learn it if it’s your current highest pet’s level or lower… if you just buy a level 25 right this second, you won’t be able to learn it. You cannot cage any wild pets, and there are a few outlier pets which can’t be caged either (eg, the Creepy Crate). So, now for the actual fights! To find wild pets to fight, look at your minimap. The battling display should be on by default, but to make sure, right click your map and make sure the ticky box next to ‘Track Pets’ is checked. 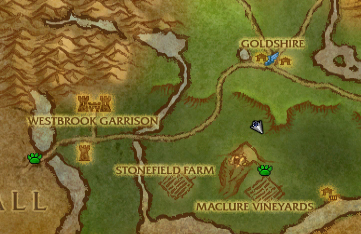 Should you see a green paw print on your map, it will correspond to a wild pet with a green paw print hovering over its head. Any pet with a paw print like this is ready for a fight. 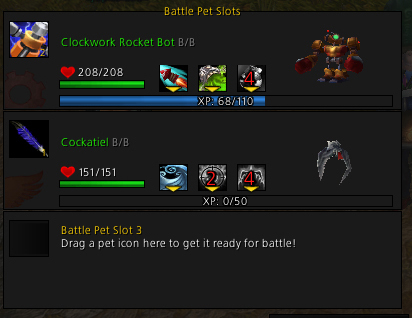 If you walk up to one and right click it, you should be drawn into your first pet battle! You do need to be out of combat (if you right click while in combat you’ll just auto attack and kill it, and if somebody PVPs you, even with a non-damaging ability, you’ll immediately drop the fight), and you need to be standing on level ground with enough space around you for battling. If you’re swimming or flying, or in a weird place, such as standing on the edge of a cottage (a completely hypothetical example apropos of nothing), you’ll get an error message. If you walk around a little bit you should be able to find a place to battle. The battle is seeded from your position, not the pet’s. At first, you’ll only have one ability for your pet to use. The other slots will unlock as your pet levels up. You will also have a few other player-side options. 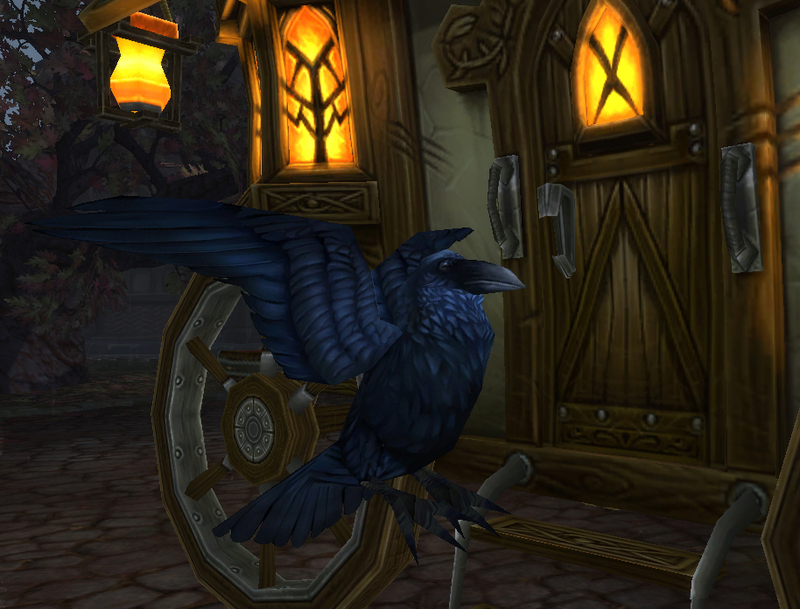 You can trap the pet once it gets low enough, swap your pets around, forfeit the match, (doing this for non-tamer battles will cause your pets to take 10% damage), or pass your turn. For most of these, you can use hotkeys. 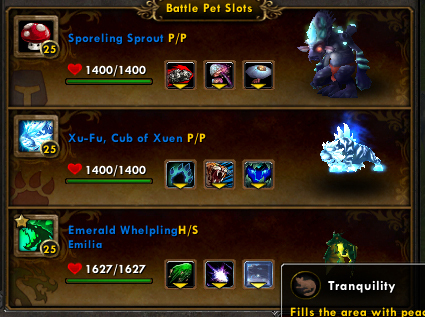 Your pets’ abilities are 1-3, swap is 4 and trap is 5. Pass and Forfeit don’t have default hotkeys, so you have to click those buttons. You can see these hotkeys at the upper right of each ability box on the toolbar. The actual fighting is fairly intuitive when you’re starting out. Just use your pet’s available abilities. You should be able to decimate most pets in starting zones. Generally, if your pet happens to have a ‘strong’ ability, use it. Avoid using ‘weak’ abilities. You’ll be able to tell by the green up arrow (strong) or red down arrow (weak) displayed on the button (eg, the first ability in the screenshot above is strong). If you’d like to capture that pet, use your trap. 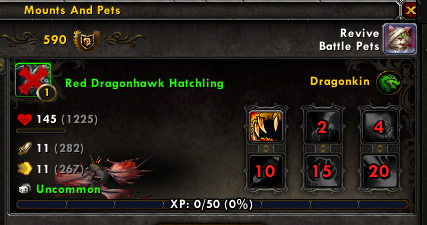 The catch to trapping is that you can only use the trap when the wild pet’s health is below a certain percent. 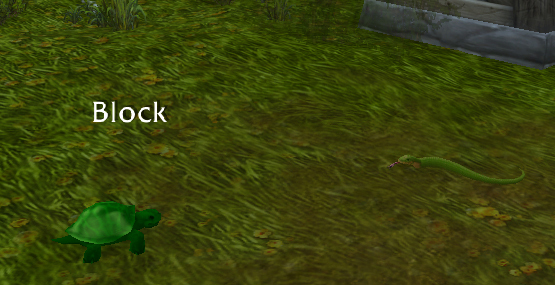 You may get an unlucky crit and kill the pet, or your trap may miss enough that your pet dies. After a fight, your pet will likely be hurt or dead. Don’t worry! As a beginner you can either use the free ‘revive pets’ ability, which is right beneath the X close button on your pet tab, or go find a Stable Master and pay 10 silver. You can’t use the free heal within 3 minutes of logging in a character, because it has a 10 minute cooldown, and they don’t want you to just log on an alt, heal & log out to circumvent the cooldown. If your pet isn’t hurt too badly, you may want to continue fighting. If your pet levels, they refill their HP completely, and after each win they’ll heal a little bit. And now, you can go out and fight more pets! HOORAY! When your pet hits level 3, your second pet slot will unlock. 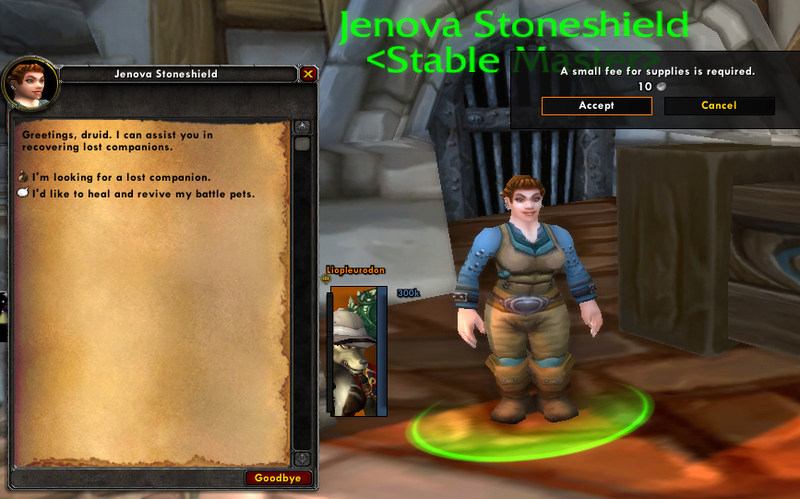 You can either add a different vendor pet, or a pet you’ve trapped, to your team. The next post in this 101 series will focus on the basics of team building. This entry was posted in Pet Battles 101 and tagged 101 on September 26, 2013 by Liopleurodon.